Graham McPherson (born 13 January 1961), better known as Suggs, is an English singer, actor, former radio DJ, television and radio personality, who is best known as the frontman of the band Madness. 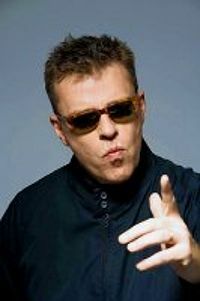 Suggs provided additional vocals for "Piccadilly Palare" and "Sing Your Life". ↑ Suggs Wikipedia page. Wikipedia. Retrieved from wikipedia.org. This page was last modified on 16 April 2013, at 00:53.